US wages grew 2.9% year on year in January, the highest since 2009. The higher than expected wage growth raised inflation fears and drove the S&P 500 down 2.1% last Friday. The US 10-year Treasury bond yield rose past 2.8%, a level not seen since 2014. Are inflation risks back? In Citi's view, there isn't enough sustained upward pressure in the goods and services components of the Consumer Price Index for inflation to be a significant risk. Core goods inflation, which excludes energy, has been trending lower. The impact of a weaker US dollar, which historically has helped to lift imported inflation, is now being offset by lower costs brought about by technological disruptions. Services inflation, excluding shelter, is equally subdued. 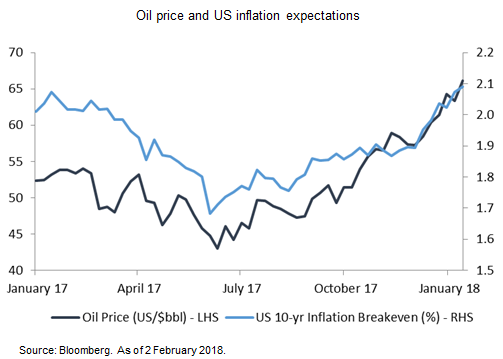 On the other hand, inflation expectations, as measured by the inflation breakeven rate, have been rising, although they appear to be driven by the rise in oil prices . See chart. Citi analysts caution that oil prices may start to head lower as early as the second quarter of 2018 with oil refinery maintenance expected to be the largest this year. The current spot price of US$66/bbl is likely to bring about significant oil supply by 2019, if not earlier. US oil and natural gas production is now expected to reach 2 million barrels/day by the end of 2018, instead of 1.5 million barrels/day as earlier forecasted. With the markets now pricing in 2.8 rate hikes in 2018 and 1.5 rate hikes in 2019 after Friday's wage report, the adjustment appears largely done. Following the sell-off, valuations of high quality bonds have become more attractive, in Citi's view. Citi analysts favour the Energy and Financial sectors within US Investment Grade corporates. The recent correction in the equity markets is healthy after the rallies in 2017. Citi analysts continue to view equity market dips as buying opportunities - earnings are expected to remain strong as the forward guidance from the Q4 earnings season has been favourable. Citi's preferred equity markets include Europe and the Emerging Markets.